To make the pickled onions, place 1/3 cup water in a small saucepan along with the vinegar, sugar and sea salt. Bring up to a boil and simmer until the sugar has dissolved. Remove from the heat and place the onions into the pickling mixture. Set aside for 15 minutes to pickle while you prepare the eggs. Shake the eggs to make sure the yolks are centered in the eggs prior to cooking. Cook eggs in a large saucepan of simmering water for 10 minutes, or until hard boiled. Refresh under cold water, peel, then halve length-ways and carefully remove the yolks with a teaspoon. Place egg white on a tray lined with paper towel. And refrigerate until required. Press the yolks through a fine sieve with a spatula into a bowl. Add mayonnaise, KEEN’s curry powder, KEEN’s mustard powder and a pinch of sea salt. Mix well until smooth, then carefully spoon into the egg whites. 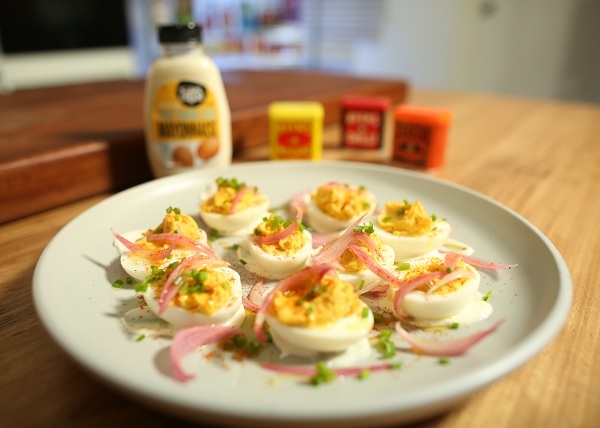 Place the eggs onto a serving plate and garnish with the pickled onions, KEEN’s chilli powder, olive oil and chives. Serve as canapés, or as a side dish.